There is little doubt when one makes the decision to purchase Birkenstock clogs which are famous all over the world that their feet will be appreciative of the gesture. This totally family operated and owned German company has a vast amount of successful experience in the manufacture of shoes and clogs. The hidden secrets of their ongoing success has been passed from one generation to the next for over 230 years now. The wonderful Birkenstock tradition was begun all the way back in 1774 when the very first shoe was crafted by Johann Birkenstock. Years later, one of the grandsons, Konrad Birkenstock, took that original shoe and did some modifications on it. He then designed the very first contoured inner sole shoe for which the company is now famous for around the entire world. What this feature does so well is to allow the unique shoe to mold closely and well with the foot. This being accomplished provides the premier level of comfort that can be possible, as well as exceptional support at all times. It is strange to think of sometimes how these items are used by people around the world. In many areas they are used by people as their choice of work shoes, while at home in Germany, many choose to wear them as slippers. 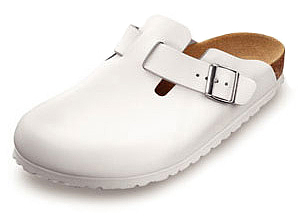 The Birkenstocks have long been touted as a popular choice by those who work on their feet for extended periods of time such as chefs, nurses and doctors. These folks attest to the fact that aching and tired legs truly get the relief they are seeking when wearing them. In recent years especially, the endorsement of highly known people such as Heide Klum has brought the tradition of Birkenstock to the circle of high fashion where it has been totally accepted. Ms. Klum is now actually working with Birkenstock as a designer of footwear. There has been one guiding philosophy for the making of shoes that the Birkenstock family has always and continues to adhere to at all times. That philosophy is to always use the resources provided by nature for the promotion and the preservation of the foot’s natural role. Besides staying with a naturalist philosophy, the Birkenstock family is totally committed to the protection of the environment. This company which was among the first to implement the use of adhesion techniques which are water soluble and solvent-free, also proudly notes that over 95% of adhesives that are implemented in the production process are eco-friendly. The company has also made the decision to invest a great deal of their resources and time into making efforts to have their machinery consume less power and produce less heat as they continue their maximum efforts to go “green”. They have also instituted a special repair service for the shoes of their customers. This decision was made in an all out effort on their part to reduce the waste that is produced every year by society. The company is always looking to offer the latest trendy fashions, but not at the expense ever of maintaining the comfort ability level. One particular favorite of the men is the Birkenstock clog known as the Boston available in either suede or leather uppers. Due to customer demand, some clogs manufactured with plastic uppers are available. Both the Garden clog and the Chef clog are easy to maintain and clean, and are both water and oil resistant. Birkenstock is anxious always for any input their customers offer, but they have always made the commitment never to compromise on the integrity and the quality of their footwear under any circumstances. Nearly everyone has had some sort of leg pain in their lifetime. It may have been in the foot or the knee, or maybe even in the back. Pain in any of these places, though, can sometimes be traced back to the same mitigating factor: shoes. That’s right, shoes. The shoes you wear have an enormous affect on your body’s posture, muscle distribution, and general foot health. Unlike most shoes, Birkenstocks can help treat the problems once they’ve occurred, but can help prevent them, as well. When shoes cause knee pain and foot pain, overcompensation can then easily lead to back pain. How does this happen, though? Take for example a pair of shoes with flat soles or without arch support. Over a period of time, the lack of arch support can cause the ligament in the foot to stretch. The stretching of this ligament is called plantar fasciitis. This can cause any number of symptoms including heel pain, sharp shooting pains in the arch and foot, and can lead to other issues such as heel spurs. The same can be said for high heeled shoes, as well. High heels cause weight to be distributed differently, so certain leg muscles feel more pressure, while other muscles are tighter. This, again, causes knee pain, which in turn causes back pain. However you try to offset the pain, the back tries harder to keep balanced and usually ends up worse. 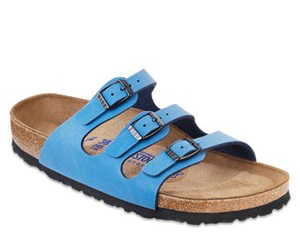 Birkenstock has footwear to counteract the problems created by other shoes. These shoes are designed to work with and strengthen the foot for comfort and healthy feet. 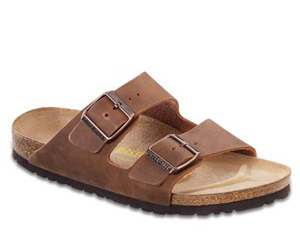 To start with, Birkenstocks are shaped like a real foot. There are no pointed toes or high heels. There is enough room for the toes to fit comfortably and have room to move, plus a “toe bar” for natural gripping. The heel cup sits in a neutral position, which distributes weight evenly, unlike heels that force extra weight on the ball of the foot. The foot-bed is contoured to match a foot, with proper arch support, as well. These properties, combined with a cork foot-bed allow flexibility that matches how a foot actually moves. The shoes mimic a bare foot, thereby encouraging natural movement. This promotes strengthening and circulation throughout the whole leg and foot. The contoured cork also conforms to your individual foot the more you wear the shoes. T hey absorb the shock of each footfall and protect and support the muscles with each step. Best known for their sandals, Birkenstocks also come in a variety of clogs, boots, and shoes for all occasions. Birkenstock can even custom build shoes for people with specific medical conditions, focusing on what those individual feet need the most. Pain can strike anyone at any time, especially if you’re on your feet all day, and especially if you wear shoes that push you off balance. The wrong shoe can be completely detrimental, while the right one can save your whole body from pain. With their comfort design, Birkenstocks promote healthy feet and posture and reduce the strain of foot pain to help in healing.